While offering a candidate a position with your company might appear to be a simple, straightforward process, there are still ways to make it better. Here is the definitive guide to making a job offer, including the best steps to take when learning how to offer a position. When making a job offer, the first step is making sure the candidate has received all possible information about the position. Have you explained benefits, basics of the job description, or any other pertinent details? It’s important to give a clear picture of day-to-day office responsibilities. 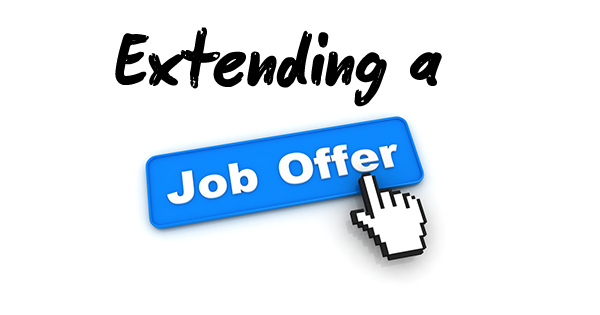 The presentation of a job offer may also be seen as an extension of the interview. When making the offer, you’ll be able to measure what is important to the candidate and what he or she may firmly agree or disagree with. You can judge whether your offer can be adjusted to accommodate the candidate’s wishes, or if you may need to continue the search for a new hire. Adding a salary increase over the candidate’s previous income, along with attractive benefits (including health, vacation, signing bonus etc. ), will increase his or her interest in the position. Don’t wait too long to extend the offer. The candidate may have other employment offers waiting, so the longer you wait, the less likely he or she might be to accept your offer. Be smart and use your time efficiently, from the interview all the way to the job offer. Make sure to call the candidate before giving a formal, written offer. Make clear your excitement at finding such a highly qualified candidate for the position, and that you are looking forward to have him or her on the team. If the candidate seems eager and accepts your job offer, you can move on with a formal offer letter. Typing up an official offer letter is one of the most important steps in making a job offer. The letter can either be sent to the candidate or reviewed in person, but it must be signed and returned for the new hire to formally accept the job. The candidate can negotiate terms of the offer—benefits, salary, vacation policy, expected start date, supervisor information, etc. — after reviewing the letter. Setting a deadline by which the candidate must accept or decline your job offer is also important. This deadline should provide enough time for the candidate to consider the offer, negotiate terms, and perhaps even look into relocating if the position is not local. Do you have tips on how to make a job offer? Let us know!